Gardiner House, Dublin, Irlandia : Rezerwuj teraz! Gardiner House is located in a beautiful historical building. It has been completely renovated to a high standard and it still retains its originality and charm. A former 200-years-old convent with its own Victorian chapel converted into a backpackers hostel for travellers and students. Our aim is to make your stay in Dublin as comfortable and enjoyable as possible, making you feel at home, while providing a high quality service at a budget price. We have a spacious kitchen open 24/7 with everything you need to cook your own meals, including plenty of fridge space and tea/coffee/hot chocolate available at any time. Free breakfast is available from 7:00 to 10:30 and includes: 2 types of bread, 3 types of Jam, 2 types of peanut butter, 3 types of cereals and the real brand Nutella, 3 types of fruits and orange juice. Some food of served during breakfast time it's available all they long in the kitchen. Gluten Free breakfast is also available upon request. The kitchen also has a dehorn in our private garden, where you can chill and have your meal while breathing some fresh air. There are many common areas, such as the dining and living room where you can hang out, meet other travellers, enjoy your meals, play pool, football table and board games, listen to music and have a few drinks. We also have a large TV room, furnished with very comfortable sofas and classy beanbags chairs where you can watch a movie or use our computers for free. A laundry room is available to wash, dry and iron your clothes. Car park is available for €10 a day. We are based in Upper Gardiner Street, next to Mountjoy Park, only a few minutes walk from O'Connell Street, which is the main street of Dublin. You can reach us using Airlink bus 747 or Bus 700 which takes only 30 minutes from Dublin Airport and stops nearby. ( Please see direction section for more info) We are also near Busaras central bus station and Connolly train station. It is also a short walk to the O2 and Croke Park, Dublin's legendary stadium. Restaurants, bars, shops and main tourist attractions such as Temple Bar and Trinity College are only a few minutes away. 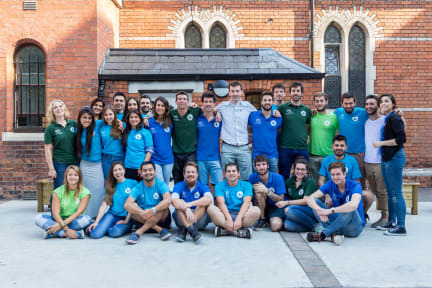 Our international staff knows the best things to do and see within and around Dublin and will be always happy to offer you practical advice or to share our own experiences. Since we are partnered with several tour companies, we can offer you some free or budget options to explore the city and the rest of Ireland. The taxi company we partner with offers a very competitive price for getting around the city or to the airport. We offer comfortable accommodation in large mix and female dorms (4,6,8,12 beds), private rooms (single, twin, triple, double) and The CHAPEL EXPERIENCE (photos coming soon). In this room you can enjoy the experience of sleeping in a former church adapted to become a dorm, while keeping its original features like windows, decorations, wall murals and holy water stoups. Each room comes with its own wi-fi router and flat screen TV for private rooms. Linen is free (yes, we will make your bed for you) and we provide high quality mattresses and individual reading lights to ensure a high level of comfort. Hairdryers are provided to all our guests free of charge. Every bed comes with its own power and usb sockets and an under-bed locker to secure your valuables. Rooms are cleaned daily and the beds are always made with fresh linen. Each floor has multiple bathrooms, which are cleaned four times a day to ensure a high quality standard of cleanliness. We look forward to welcoming you to the Gardiner House Family. Reception is open 24 hours. Check-in time is from 15:00. All guests must present a valid picture ID (EU guests: Passport or driving licence, NON EU guests: Passport) in order to complete the check-in procedure. Car park is available for €10 a day. Please note that there will be a €10 fee for the loss of room keys. Groups with minors must be accompanied by a responsible adult staying in the hostel and holding parental approval for the minors. Adults and minors cannot share dormitories. Minors cannot be facilitated in shared or mixed dormitories with guests outside of their group. If minors are part of the group, the numbers must occupy the full dorm and we will charge for the remaining bed spaces. Minors must be split between male and female dormitories. We cannot accommodate minors under 14 years of age. In the case of reservations for 4 or more individuals a security deposit of EUR 30 per person is required upon arrival for incidentals. This deposit is fully refundable upon check-out and subject to a damage inspection of the accommodation. Guests in groups of 2 people and more wishing to be accommodated in the same dorm room will need to contact the property prior to arrival for their preference. This will be subject to availability. One of the best hostels i have ever been.